Before writing a review of FXOpen I’ve researched a lot of Forex brokers that use MetaTrader 4 platform and they were one of the most talked about brokers with a very decent feedback. Furthermore, FXOpen is used by traders who trade with Expert Advisors and realizing that most readers of this site are interested in auto trading, it was a nice fit. The only problems that people seem to be having are with scalping – the servers sometime seem to be having delaying and an occasional re-quoting is happening. 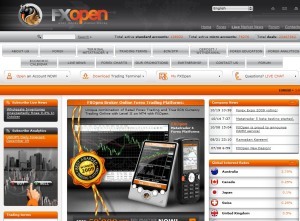 So if you’re looking for a broker for scalping, FXOpen may not be ideal. Other than that most traders seem to be having a good experience, so I went ahead and took a closer look at this broker. FXOpen is established as broker in Mauritius and is regulated by Financial Services Commission of the Republic of Mauritius. The company was founded in Cairo, Egypt as an educational center in 2003 and as a broker in 2005. The fees include the spread and additional commission for ECN account (depending on the trading volume). Note that this information is only up to date at the time of writing this article, to confirm this information as well as see any additional conditions visit the official website. Opening an account is easy – it takes just one simple form (excluding two simple steps prior to that in which you select the account type and check the agreement confirmation box). After opening the account you can make a deposit, download MetaTrader 4, login and start trading. Before you can withdraw money from your balance, however, you have to confirm your identity to verify the account by sending your scanned id (or other document of personal identification) and any utility bill to confirm your physical address. This procedure is pretty standard with all brokers and is a necessary evil, so no surprise it is here too. The deposit and withdrawal forms include credit card (after verification), wire transfer and several online payment processors. Paypal, however, is not included. Trading itself is not specific in any particular way, it’s our beloved MetaTrader 4, which you can use to trade manually as well as run your favorite Expert Advisor. To sum up, I was looking for a trustworthy Forex broker with good feedback from experienced traders, which uses MetaTrader4 (so you can also run Forex robots) and which is easy to start with for beginners (opening an account is a breeze and you can start with $1). Looks like FXOpen fits the description. And finally, remember that trading Forex is risky, so before starting trading with a real account, consider and understand it and never risk what you cannot afford to lose. I have just opened a Live account with the above broker so will keep you all updated on my reviews. how fast was the withdrawal process ? Hi my Iranian friend, thanks for the update on FX open.I’m more interested in your amazing trading strategy. A screen shot of your withdrawals will be a bonus. Please give me the guidelines on how to successfully open a live micro-account.